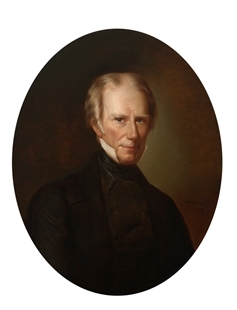 The Henry Clay portrait—the first Speaker portrait donated to the House of Representatives— was a gift from the Italian-born artist Giuseppe Fagnani in 1852. 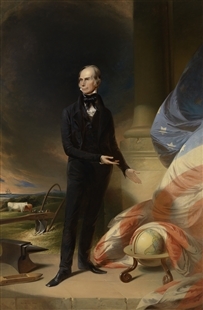 Accepted by the House on July 3, 1852 (shortly after Clay’s death), Fagnani’s portrait shows Clay as he appeared during his career in the House several decades earlier. The artist’s paintings of allegorical subjects are in notable collections, such as the Metropolitan Museum of Art, but he was also known as portrait artist, depicting such famous individuals as Daniel Webster and Samuel F. B. Morse. From the Blog: Who Kicked the Dogs Out?